With the exhibition SOUNDS OF VIENNA Leica Gallery Vienna celebrates the 100th anniversary of Franz Hubmann (1914-2007), one of Austrian photography’s finest. His last exhibition in Vienna during his lifetime was presented by Photomuseum Westlicht on the occasion of his 90th birthday. Like no one else, Franz Hubmann – famously called the Austrian Cartier-Bresson – managed to capture the sound of the city with his Leica, the Viennese street life with its Cafés, bohemians, fiacres and antique shops. In the exhibition we meet them all again: the legendary waiter Ali from Café Hawelka, who is now at least as famous as his literary guests, the freezing florist in Stadtpark or the woman transporting her plant in a baby carriage across the district of Döbling. As Hubmann was a passionate music lover, it wasn’t only the sound of the streets which interested him. During the postwar decades he took pictures of the international music scene visiting Vienna, his musical taste ranging from the classic with portraits of Herbert von Karajan or Yehudi Menuhin to modern jazz, represented in the exhibition by mesmerizing shots of Miles Davis, Nat King Cole, Louis Armstrong and many others. Hubmann also had an eye for the latest developments in arts and performance and thus was one of the few to capture the anarchic cabarets of avant-garde group Wiener Gruppe on film. All prints on display are for sale. Prices upon request. On the occasion of Franz Hubmann’s 100th anniversary Christian Brandstätter Verlag publishes the book FRANZ HUBMANN. SOUNDS OF VIENNA with many photographs from the exhibition and essay by Karlheinz Roschitz, Christian Brandstätter, Axel Hubmann und Gerald Piffl. The show at Leica Gallery Vienna coincides with a Franz Hubmann exhibition at Leica Gallery Salzburg, also celebrating his 100th anniversary. Two years ago Danish Magnum photographer Jacob Aue Sobol embarked on a journey, crossing the Asian continent from Moscow via Ulaanbaatar to Beijing. Arrivals and Departures is the photographic log-book of this trip. Recorded with the Leica M Monochrome it recounts Sobols encounters with the people along the Trans-Siberian Railway in fierce black and white images. None of the photographs is just a fleeting record of a traveller. On the contrary, Sobols portraits are characterized by an almost painful intensity, the intimacy of the pictures leaves no space for casual bystanders. “It was a trip I had always wanted to take; The legendary journey along the Trans-Siberian Railway. Denmark, my native country, you can cross in five hours by train, but in Russia the distances are huge. I was curious if the connection between people and places would feel different considering the fact that I would pass every tree, every house and every village on my way to Beijing. The first chock came already when I entered the train. It was completely empty. The whole idea of the project had been to meet people on the train and make intimate stories from the train compartments. But riding this ghost-train, I had to change the concept: The intimate work had to come from my encounters with people in the cities and the train became the red thread connecting Moscow, Ulaanbaatar and Beijing. On the train I ended up with my camera glued to the window photographing the change of landscape as we were let along the Russian forests, the Mongolian desert and through the mountains to Beijing. But it was not only Russia, Mongolia and China that was unknown land to me - so was my equipment. It was my first time using a digital camera. Everything was new, but then again, my ambition is always the same; to use the camera as a tool to create contact, closeness and intimacy. Every time I start a new project, I start shooting in color, because I am afraid to repeat myself, but later I realize that it is not really something I can make a rational decision about. If I can't emotionally connect with my images, if I can't feel that pinch in my stomach, they mean nothing to me, and so I always return to B&W and find my voice again. Working with black and white has always been the most direct way for me to reach more existential questions. In black and white I feel my images are not bound to a specific location or time. They create their own universe. From February 13th to June 14th Leica Gallery Vienna shows photographs by Austrian skiing-pioneer and Leica-trailblazer Stefan Kruckenhauser (1905-1988), who revolutionized alpine sports during the 1950s with his innovative skiing technique. It is hard to decide in which of his two roles – photographer or skiing-pope – Kruckenhauser was more influential. As an image creator Kruckenhauser affected a whole generation of amateur photographers with his books and had his part in making small format photography popular in Austria. Camera manufacturer Leitz awarded him the 700,000th Leica in 1955 for his achievements in the field of photography. As a skiing educator known as the father of the “Wedeln”-technique he influenced the style of millions of alpine skiers all over the world. In the 1960s American magazine Sports Illustrated compared his impact on alpine sports to Sigmund Freud’s influence on psychoanalysis. Kruckenhauser’s photographic work is to a large extent connected to certain book projects. This is also true for the photographs in the exhibition, which derive from the layouts for three of his books. The display presents drafts for single pages and spreads, which show Kruckenhauser as an equally talented photographer and graphic designer. In the case of the “Österreichischer Schilehrplan” (Austrian Skiing Curriculum), Kruckenhauser was responsible for the skiing instructions as well as for the book’s graphics and its photographic illustrations. Especially the movement studies, which derived from enlarged and collaged single images of a movie camera, are a combination of creative finesse and educational clarity. For the illustrated book “Verborgene Schönheit” (Hidden Beauty) Kruckenhauser travelled Austria during summers and documented the local architectural heritage, as diverse as the Stift Melk and a rural Tyrolean hut. The photographs of what is maybe his most favourite project – “I wanted this book! I took up the Leica!” – often combine a romantic subject with an objective style. Contrary to the diverse architectural views in “Verborgene Schönheit” the volume “Ein Dorf wird” (A Village is Born) is a continuous narrative essay, which follows the construction of a model village from the first plans to the move-in of the inhabitants. The photographs of the collectively working men and the smiling children, who finally move into the neatly plastered and fenced houses, perfectly embody the spirit of the reconstruction years after World War II. Kruckenhauser arranges the single shots to an elegant narration, which in 2004 convinced Martin Parr and Gerry Badger to include “Ein Dorf wird” into their standard volume on the history of the photobook. The photographs on display are for sale. Prices upon request. From 14 August 2013 Leica Gallery Vienna presents works by Vienna-based photographer Kay von Aspern. Von Aspern is a Street Photographer in the emphatic sense of the word: He never leaves the house without his camera. His photographs spring from a deep sensitivity for the strangeness of everyday life. Things that usually escape general attention in the turmoil of the cities, van Aspern records with his Leica: small-scale dramas, odd encounters, telling glances. For a brief moment, everyday life is condensed and thus enhanced in a random composition. It is these moments, which von Aspern snatches from the current of time. Kay von Aspern is part of a vital scene dedicated to Street Photography, which in recent years has emerged in Vienna. With the genre of Street Photography these photographers take up a tradition, which since the end of the nineteenth century, when smaller and lighter cameras began to allow for a higher mobility, produced some of the most iconic images and some of the most abiding myths in the history of photography. Henri Cartier-Bresson’s “moment decisive”, the decisive moment of an incident which is to capture on the photograph or the notion of the camera as an extension to the human eye – those are the ideas which make up the essence of Street Photography. Like a flaneur, the photographer strolls through the public space, immersing himself in the stream of pedestrians, constantly staying alert for the particularities of the everyday. “It’s like going into the sea and letting the waves break over you”, Joel Meyerowitz and Colin Westerbeck wrote in their definitive book on Street Photography Bystander. “You feel the power of the sea. On the street each successive wave brings a whole new cast of characters. You take wave after wave, you bathe in it.” Kay von Aspern, born in the town of Itzehoe in Nothern-Germany, throws himself into the current of Vienna since 2005. It is often on the fringes of official events where he finds his pictures: the margins of a carnival parade, waiting supporters at a party convention, passers-by at the national holiday celebrations – fleeting moments which only become manifest once von Aspern takes a photograph and thus concentrates the moment in an image. His photographic gaze is always full of wit and makes the small absurdities in the random constellations of our surroundings visible – in black and white as well as in colour. The works on display are from the years 2006 to 2013 and have almost exclusively been photographed in Vienna. Additionally, to reflect the mass of images Kay von Aspern confronts himself with on a daily basis, each day of the exhibition he will take a picture and send it to the Leica Store where it will be printed and pinned to the gallery wall. Like a block on paper, these images will form a growing scrapbook of his work. he Leica Gallery in Vienna presents a selection of portraits and reportage photographs by the Graz-born Magnum photographer, Inge Morath (1923-2002). During her career as a photojournalist, which spanned almost 50 years, she travelled around the globe. Encounters with people were always a driving force behind her work. Morath's travel reportages are based on a deep curiosity about the culture of a country and the living conditions of its population. Her portraits reflect a compassionate interest in renowned models, as well as arts and culture personalities, that she got to know with her camera. Inge Morath came relatively late to photography. When she bought a used Leica in 1952 to make her first pictures, she had already worked for several years as a journalist. In collaboration with the photographer Ernst Haas, she worked as a reporter team in post-war Vienna – he made the pictures and she wrote the articles. Robert Capa, who in 1947 founded the photo agency Magnum Photos with Henri Cartier-Bresson and other photographers in Paris, became aware of their work and brought them to the Seine. In Magnum's early years, Morath worked as a writer and picture editor. By evaluating the contact sheets of her fellow photographers and through her work with Cartier-Bresson, whom she assisted on trips, she trained her photographic eye. When she presented her first photographs to Robert Capa for the first time, she initially claimed that they had been taken by someone else. Only when it became apparent that Capa liked the pictures Morath revealed herself as the originator. In 1955 she became a full member of the agency - and was one of the first women photographers to be part of the elite circle. Morath's first assignment for Magnum took her to England and Spain, where some of her most famous pictures were taken. Her early photographs show a clear sense for the decisive moment of a scene. She shared her preference for surrealist charged compositions with Cartier-Bresson. In the late 1950s Morath's moved to the USA, where she increasingly worked as a set photographer for Hollywood productions alongside her reportages. During the filming of The Misfits in 1960, she met her future husband, the renowned American playwright Arthur Miller. At the time of the filming Miller was married to the lead actress Marilyn Monroe. Morath and Miller were married two years later and alongside being a couple they also worked together on a number of projects, particularly after the 1970s, such as books based on their trips to Russia and China. Inge Morath, a cosmopolitan person who was fluent in several languages, once described photography as the most universal of all languages. On her journeys she was confronted with the fact that her German mother tongue was seen after the war as the language of the enemy. She found in photography a means of expression that enabled her to overcome the former front lines, to report about mankind from over the borders and to speak to the people. The second exhibition in the new Leica Gallery Vienna offers a focused insight into a significant part of world history from the perspective of Magnum legend Robert Capa (1913-1954). The exhibits document the beginning of the Japanese invasion of China. The costly military conflict began in July 1937 as a Second Sino-Japanese War and ended in 1945 as part of the World War II. Around 30 photographs by Robert Capa, a documentary film, as well as publications of the Formation time are presented. Full text comments explain the historical and political background. On 16 February 1938 Capa reached Hong Kong by ship. His seven months stay in China spanned the phase of the war immediately after the massacre of Nanking, when the city Hankou was a temporary headquarters of the government. In this central Chinese City, at the confluence of the Yangtze River and the Han River (now part the metropolis of Wuhan), Capa documented the propaganda of the Chinese National Kuomintang, field exercises and various air attacks of the Japanese. At the battle of Taierzhuang he could take photographs of the decisive front up close, as well as the flooding of areas around the Yellow River, which the Chinese used to try and stop the Japanese, and the catastrophic destruction from the massive air raids by the Japanese in the second half of 1938.
he 25-year old native of Hungary and later co-founder of Magnum, Robert Capa was already a well known major war reporter at the time. Shortly before he managed to achieve great success with the famous image of a falling solider in the Spanish Civil War; a photographic icon of the 20th century. In China Capa worked for the magazine LIFE as well as a camera assistant for the Dutchman Joris Ivens, who shot the documentary film "The 400 Million" with John Fernhout. After Capa had documented the enormous devastation in the city of Hankou, he left the scene in September 1938 to continue his reports in Spain. For some time, the Austrian born number two ski jumper of all time, Gregor Schlierenzauer, has had a passion for photography. "Schlieri" photographs with his Leica M9 and represents a young generation that photograph passionately without mobile phones. Specifically when on trips he finds his motifs and lightness and spontaneity, but also sincerity and sensitivity characterize his work. "From a young age I was able to see a lot of the world, so I see a lot of things differently. Since I began taking pictures I have a more open approach to life and look at things in much closer detail. I seek the quiet moments in my life, enjoy them and take them with me, "says Schlierenzauer. His talent as a young photographer has developed tremendously in the last years. This is the reason why he was included in the Leica talent pool and sponsored by Leica. 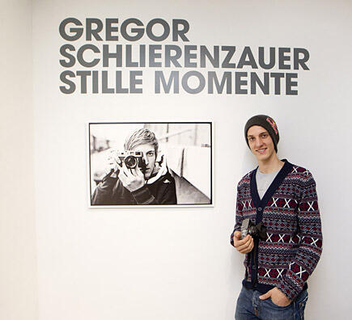 Schlierenzauer, since September of this year, is the first prize winner of the Leica mentoring program, with which the company wants to support young photographers.
' Despite my tender age, I have already been lucky enough to see much of the world. That's why I see a lot of things differently. Since taking up photography, I've had a more open attitude towards life and look at things more closely. I seek the still moments in my life, enjoy them and take them with me' say Gregor Schlierenzauer about his life and his work. His progres as a young talented photographer was tremendous. That is why today he is part of the Leica talent pool and promoted by Leica. In September 2012 Gregor has been awarded a prize in the Leica Mentoring Program with which the Leica company wants to support young photographers.